In the past decade many Hazaras are being singled out and murdered cold-bloodedly  in Quetta, the provincial capital of Balochistan. They are subjected to an ethnic onslaught by extremist Islamist and religious networks roaming over-freely across the city. The Hazara  minority are Hazaragi/Dari speaking people. They are ethnically Hazara and religiously Shiite Muslims. However, there are considerable number of Ismaili  and Ahmadi  Muslims among them. Mainly they live in the central highlands of Afghanistan called Hazarajat  or Hazaristan. They make the third largest ethnic minority in the country. The Hazaras mostly live (approx 700,000) in Quetta , Balochistan, the largest province of Pakistan, along with the Balochs & Pashthons. In recent times at least 700 members of Hazara community have been gunned down mercilessly and thousands left permanently disabled. Hazaras have been suffering from sectarian violence by the extremist terrorist outfits Lashkar-e-Jhangvi (LeJ)  and Sipah-e-Sahaba (SSP ) during the past decade. These terrorist organisations are Anti-Shi’a and, aim to transform Pakistan into a complete Sunni state, essentially through violent means. SSP and LeJ have claimed for having part in almost all of the incidents occurred on the Hazara minority in Quetta. These terrorist organisations don’t even attack anonymously, they also publish videos of the scene of tragedy while slaughtering the Hazara community and send open letters to frighten the community members even more. The banned terrorist outfit LeJ published an open letter addressing the Hazara community , in the letter they stated that: ‘Hazaras are worthy of killing and we will rid Pakistan of these unclean people.’ These fears have made many Hazaras flee the country in recent years. Lashkar-e-Jhangvi also published horrible videos of the massacre of Hazara pilgrims in Mastung District - where passengers were forced off a bus, and sit on the ground. Seconds later the terrorists opened fire with Kalashnikovs, with the resulting carnage being graphically recorded. The Pakistani government have failed to provide the citizens security. While talking to the media outside Parliament house, Balochistan’s chief minister (CM) Aslam Raisani  said: “I will send the victims family, a truck load of tissues to wipe their tears!” In April 2012, the security forces in Quetta managed to arrest some terrorists. Hazara minority scheduled a worldwide protest demonstration  in October 2011 as the killings increased. They demonstrated in different European, American and Australian cities, to ask the Pakistani government take serious actions for ending the series of Hazara target killings. 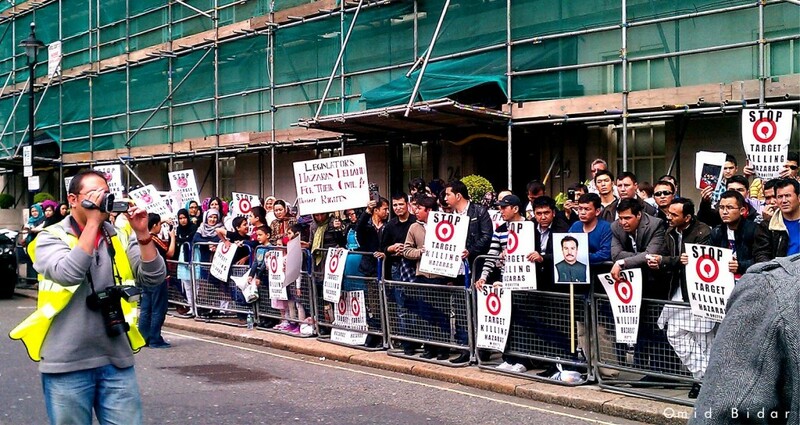 The Hazara Democratic Party (HDP)  scheduled worldwide protests to condemn the Hazara killings, for the second time. According to the schedules thousands of Hazaras demonstrated in London , Hamburg , Canberra , Newyork , Toronto  and many other cities around the globe. The protests were held in front of Pakistani Embassies  to ask the Pakistani Government to take actions for preventing Hazara killings. They also aimed to draw the attention of the world and media to the on-going Hazara killings. The Resolution  for the worldwide protest produced by Hazara People can be read here. @Sajjad_Changezi (Sajjad H. Changezi)  : A commoner #Hazara can't travel, run a shop, a #Baloch activist can't campaign while #banned outfits enjoy liberty.